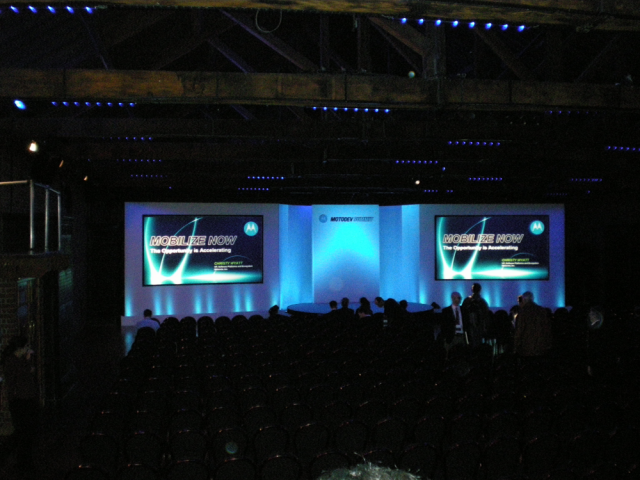 Last Friday I had the opportunity to head down to London to see the Motorola MOTODEV Summit world tour come to town. MOTODEV is Motorola's attempt to woo the developers of the world to their platforms and devices - attempt to capture some mind-share and give us some insight into what is around the corner for their technology. It was a pretty small gathering, at "The Brewery" near Liverpool Street Station in the heart of "The City", an area of London frequented by blokes in suits carrying Blackberries and shouting "Sell! Sell!" in increasingly fervent tones. 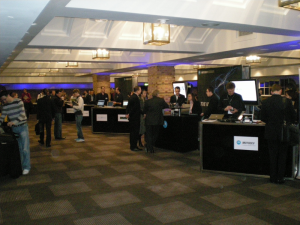 Members of Motorola's "ecosystem" were there, and about 24 low-key stands were put up so that various parties could hawk their wares. About half of the people there seemed to be Motorolans (yes, that's what they call themselves. I know this 'cause I used to be one...), and there were quite a few suits and ties. 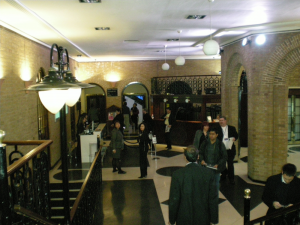 I recognised a few faces from the MoMo London events, and a few folks from overseas had even come in for the occasion - I spotted some Israelis, a few of the nice folk from Funambol in Italy and I spoke to someone who had come in from Barcelona. It's fair to say things even felt a little European. Obviously, there's a lot of buzz about Motorola. For all of the horrendous history they have on the user interface front, Captain Zander and the gang have been doing some hard work whipping their phone platform into shape for the 21st Century. They have a great bunch of engineers and their "feature phone" devices are some of the most popular in the world - the bestselling device of 2006 I believe was the RAZR - but these "big hits" are few and far between, and Motorola just hasn't managed to build the sheer volume of models that companies like Nokia have. Motorola has become pretty strong on style, but their software has unfortunately been weak - it's fine in the guts of the thing but the bits the user sees have been very poorly thought out. They were a bit late to the UI party. So I was certainly interested to hear what they had planned. Despite the advertised breakfast, a woefully small stack of pastries was on offer (note to event organisers - please - a proper feed in future?) but free WiFi and a lounge-like atmosphere made for a nice escape from the biting cold outside. 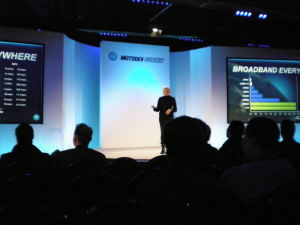 The keynote kicked off at about 9:30 and Christy Wyatt greeted us with Motorola's perspective on where the big challenges were in the mobile industry and how Motorola was going to address them. The main theatre where the keynote was given. So Motorola is exhibiting the broader malaise of the mobile industry. They are fragmenting their platform strategy. Frankly, this isn't a help to developers, but a hindrance. They offer a confusing array of development choices and no way of addressing their handset base with a single effort. Perhaps it's unfair to think that this is even possible, but it looks to me like they are backing every horse - a bet which is going to be expensive and inefficient. 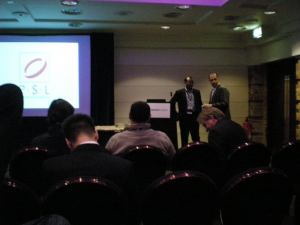 The question on everyone's minds, of course, was - what about the Open Handset Alliance? Motorola are part of the gang there, so what are they doing about it? Can they tell us anything about the platform and when are they going to launch something with it? Predictably, the nice people at Motorola looked a bit like rabbits caught in headlights - because although they were part of the OHA, they had no idea of the shape of Android was actually going to take. So the OHA doesn't look like a club of collaborators so much as a group of companies interested in the rabbit that Google is going to pull out from their hat. 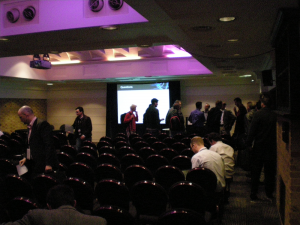 So the sparsely populated hall emptied out - Motorola had put on a wide spread of talks in 5 different tracks that people could attend. 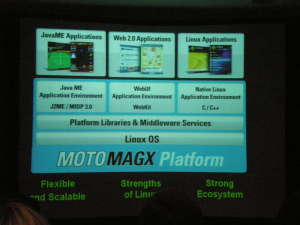 The one that had really caught my eye was the presentation on the MOTOMAGX platform. I knew from the past that Motorola had been trying to do something with Linux but had thus far been unsuccessful in their attempts to commercialise it. How far had they come? Had they done it yet? Oh, and all of these SDKs will be in a single "unified" development environment (Eclipse, of course). They should all be available in H2 2008, and we are certainly looking forward to the possibilities - particularly in the native application space. So - even more fragmentation. There are 3 different application frameworks to choose from - on the one device platform! The MOTODEV road show heads off to Beijing next in order to spread the news. But a fragmented mobile world we live in today looks set to get even more so in the coming years. It's going to get a lot worse before it starts to get better.